India is participating in the Shanghai Cooperation Organisation (SCO) Defence Ministers Meeting for the first time. The 15th SCO Defence Ministers Meeting was held at Beijing in China, today. Speaking at the meeting, Raksha Mantri Nirmala Sitharaman highlighted India’s keen interest in developing an expanded partnership with the broader Eurasian region. In doing so, India has sought to build on her long-standing ties of deep mutual trust and confidence with Russia, vibrant historical and cultural linkages with countries of Central Asia and closer development partnership with China and to further enhance and deepen ties with all the member countries for mutual benefit.Smt Nirmala Sitharaman stated that in the days ahead, India will work with the SCO partners to energize and revitalize the age-old ties of affinity with the countries of the region. She sought a forward looking partnership based on robust dialogue and concrete initiatives to enhance the economic, trade and cultural cooperation as well as mutually beneficial interactions on defence and security matters.She called for SCO members to work towards enhancing greater communication among member countries within the region as well as in the broader international context. This is essential for progressive trends towards stability and peace to reassert itself and to arrest the current drift in ties between major powers and to address any possible implications for the region. Raksha Mantri Smt Nirmala Sitharaman said that many problems that confront the region, such as climate change, cyber security, narcotics trafficking or violent trans-national crime require solutions based on cooperative frameworks that involve all countries and stakeholders. This is particularly necessary to address the persistent threat of cross-border terrorism and extremism.Smt Sitharaman stated that international terrorism is today the most serious threat to our peaceful societies. Terrorism threatens to derail our developmental aspirations and create sustained instability both within our countries and across national borders. She called upon the member countries to closely coordinate and adopt a policy of zero tolerance towards terrorism. She contended that arguments of political convenience to provide an alibi for terrorist groups or organisations that support terrorism through material support or otherwise are no longer tolerable. Indeed, as the world has now realized, there are no good terrorists. India, she stressed, will continue to engage strongly with the SCO-Regional Anti-Terrorism Structure based in Tashkent in this regard.In this context, she said that we must also work towards the goal of a stable, secure and peaceful Afghanistan. She strongly condemned yet another tragic terrorist attack in Kabul, recently. The SCO must adopt an uncompromising approach towards the persisting threat of terrorism in Afghanistan, as it is essential to advance peace and prosperity in the region. India is committed to doing all it can to assist Afghanistan in its quest to regain stability and reconstruct its economy and polity. This includes cooperation in building capacities and capabilities of the Afghan national security forces. In doing so, India will continue to be guided by the requirements of the government of Afghanistan and the shared objectives of the international community, Smt Sitharaman said. 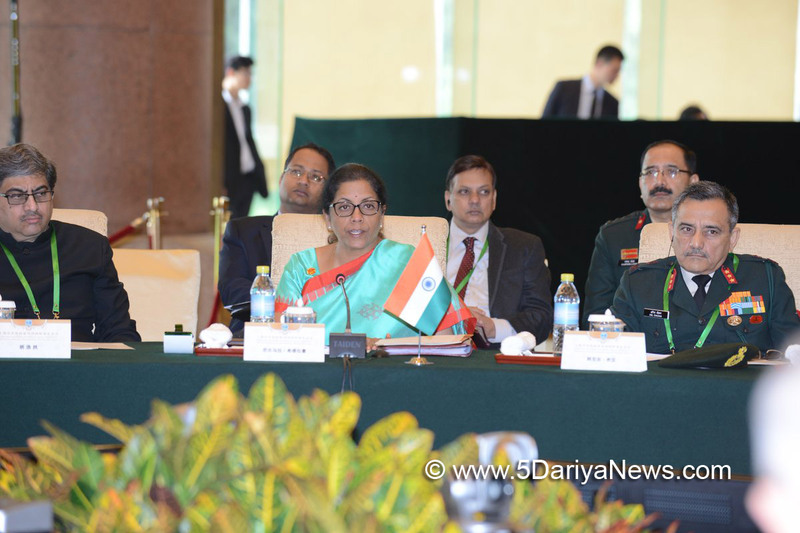 Since defence cooperation, especially enhanced linkages between armed forces is an important dimension of SCO, Smt Sitharaman stated that India is keen to explore the full potentialities of this engagement. India will engage with a positive approach and an open mind on all issues related to defence cooperation within the SCO framework.She stated in this context “we note the decision to set up an Experts Working Group (EWG) mechanism under the SCO Defence Ministers Meeting to support greater cooperation in the defence field. There is a need for further discussions on how the EWG mechanism can be best developed to meet our shared requirements and objectives for defence cooperation in the SCO framework. India has already commenced practical steps to take forward defence engagement under the framework, as reflected in our first ever presence at this Ministerial Meeting and participation of the Indian Army Band at the Fanfare for Peace Military Tattoo being held in conjunction with our meeting today”. Further, she stated that “we will also engage as feasible on the items under the Agreed Programme of activities for defence cooperation under the SCO for 2017-19. As we move ahead, India will also explore the possibility of coordinating some SCO defence activities in the coming years”.The Raksha Mantri stated that India will participate in the SCO’s Peace Mission joint military exercises being held in Russia later this year. As India enjoys excellent bilateral defence cooperation with a large number of SCO countries especially with Russia as well as with all of India’s Central Asian partners represented in the SCO, she expressed belief that cooperation in the SCO framework will help reinforce India’s efforts to strengthen bilateral cooperation with the partners in the region in the field of defence.Recognizing the value of improving regional transportation and communication networks through mutual consultation, sustainability and sharing of benefits, the Raksha Mantri opined that it can create a network of physical and digital connectivity that extends from Russia’s northern regions to the shores of Indian Ocean. The International North South Transportation Corridor is an important step in that direction. However, she noted that it would also be essential that such initiatives respect the sovereignty and territorial integrity of all countries.